Another update in the form of a Windows binary compiled from the latest cpuminer-opt (source) CPU miner with added optimizations for many algorithms using the AES-NI instruction set (also works on older SSE2 capable CPUs). 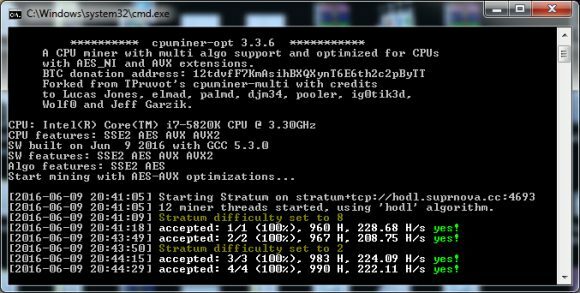 Up until recently the cpuminer-opt was available only for Linux users, but starting from version 3.3 there is also Windows support and we have compiled 64-bit binaries of the miner for Windows for the latest released version 3.3.8. The latest update brings some performance improvements such as blake2s with about 10% higher hashrate, support for new algorithms such as LBRY, Whirlpool and WhirlpoolX as well as fixed Skein2 that was apparently broken in the previous version. In the archive below you can find multiple executable files that are compiled for different CPU architectures that support AES-NI instructions, so you are welcome to try them to see what works best for you. If your processor does not support AES-NI (CPUS introduced 5 or more years ago), then you might want to use the cpuminer-sse2.exe binary. The default cpuminer.exe is compiled for Intel Westmere, the first Intel architecture that has support for the AES-NI instruction set and cpuminer-amd.exe is bdver1 which should work on all AMD processors with AES-NI support. If you have a more recent Intel Sandybridge, Ivybridge, Haswell or Broadwell-based processor you can try the respective binary to see if that will squeeze some extra performance, or you can compile directly on your PC with the native instruction set supported by your CPU. 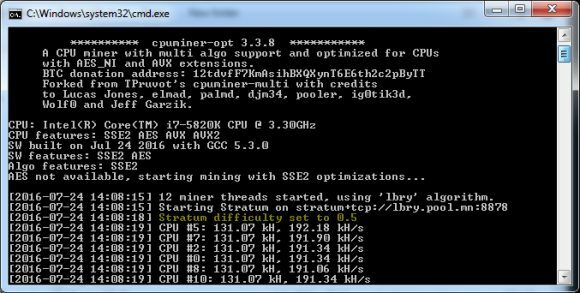 Here comes a cpuminer-opt Windows binary compiled from the latest (source) of the CPU miner with added optimizations for many algorithms using the AES-NI instruction set, though the miner also works on older SSE2 capable CPUs with lower performance. Up until recently the cpuminer-opt was available only for Linux users, but starting from version 3.3 there is also Windows support and we have compiled 64-bit binaries of the miner for Windows for the latest released version 3.3.7. The latest update brings some performance improvements such as the Lyra2 now being AES optimized and having +7% higher performance, a small increase of about 1% in most chained algorithms (X11, Quark, Lyra2v2, etc) and some fixes such as Lyra2v2 now being properly reported as AES optimized. The cpuminer-opt is an optimized CPU miner (source) with added optimizations for many algorithms using the AES-NI instruction set, though the miner also works on older SSE2 capable CPUs with lower performance. 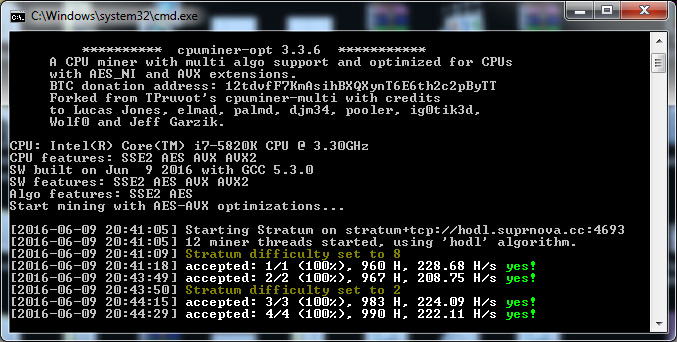 Up until recently the cpuminer-opt was available only for Linux users, but starting from version 3.3 there is also Windows support and we have compiled 64-bit binaries of the miner for Windows for the latest released version 3.3.6. The latest update brings some fixes and improvement including fixed reporting of AVX support on startup and Cryptonight algorithm support now working on Windows as well.